Of Horses and Men: What a Great Day! 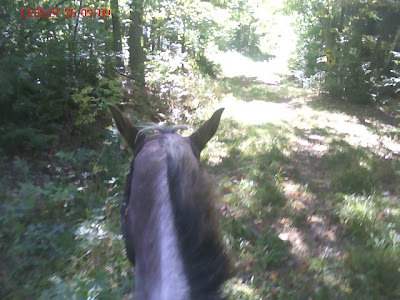 Pic above is a quick shot of the trail ride Possum and I went on on Saturday. Yes, you heard me right from the title of this post, today is a great day. No particular reason other than the sun is shining and I hopped out of bed this morning with a feeling of purpose, strange I know. The air is warm and clear, and despite the fact that I work a looong day today it seems to be working out alright. I also get frequent calls from my special cowboy friend which also helps to make the day move along in a pleasant way. Things have been pretty quiet since the show. I wanted to give Possum some time off and he just got a new round bale when we got back Sunday night, so I let him gorge on that most of the week. Saturday was a gorgeous day with a small bite to the air, perfect sweater weather! 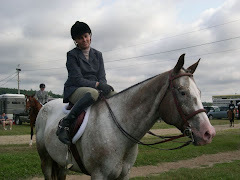 I slept in some, took a shower and decided to leave the dogs at home so I could thoroughly enjoy my ride on the pony. Possum came right to the gate and I led him into the barn. I spent a while grooming him and looking him over. He is starting to shed his summer coat for a thicker and more dense winter coat, aghhh!!! I'm not ready for winter. I saddled him up and led him over to the picnic table and hopped on. My plan for the ride was to have fun and enjoy the weather on the trail. The ride was great, it was just Possum and I and we were able to have some bonding time together. No stress, no agenda, it was great. When the footing allowed on the way out we trotted some. It felt good to feel the extra spring in his step from having the week off and he went forward willingly. 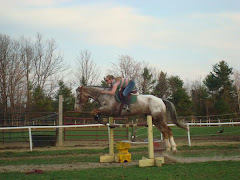 About half way through our ride I couldn't resist and we took a detour to a large field and then I just let him fly. I forced myself to be aware of everything. The sound of his hooves thudding in the mowed grass, his rhythmical breathing, the up and down of his neck, the wind in my face and the sound it made as it screamed by my ears. I looked up to see bright blue sky and the sprawling field ahead, this is heaven I thought to myself. Forget the dusty arenas, the yelling of trainers on the sidelines, the nervous chomping on the bit by the horses and the scared and tense look of the riders. I was riding with a huge smile on my face that I couldn't hide if I tried. All too soon the end of the field came into sight and I slowly pulled him up. He gave a toss of his head as a small protest to slowing, but he too saw that the woodline was approaching. We walked the rest of the way back until we hit the road. It was nice with my feet dangling out of the stirrups and the steady swing of his back as he walked with purpose. I have to confess that on the straight stretches I asked him for some collection and to reall work through his back as he trotted. Then when we cantered I would ask every few strides for a flying change just to make sure he wasn't rusty, he wasn't. He did everything I asked, I could tell that he too was feeling good. When we got back his neck had dried to a crusty sweat and we both felt better, like some satisfaction had been filled. I untacked and gave him a brushing and threw him back out. I'm gonna be real busy with work this week, working late 4 nights this week until 8p. I hope one of those nights I can get out and ride before the sun sets. That's about all that is happening. Yesterday it rained all day. I went to the laundromat and then watched movies with the roomie most of the day and cleaned the apartment. I may be planning on a trip out to MN with the roomie sometime in November, but it's purely in the planning stages right now, but I'm keeping my fingers crossed. Hope you all have as great a day as I'm having. Yay for special cowboy friends! Sounds like a great ride. Glad you and Possum are getting some time away from the stress of the show ring to bond and get back to doing what you both enjoy. I suspect Possum will let you know what he thinks you guys should do. I still think he's a very handsome boy. Special cowboy friend - did I miss something?